Common Buckeye with its' wings spread at Eastern Neck Island Refuge. 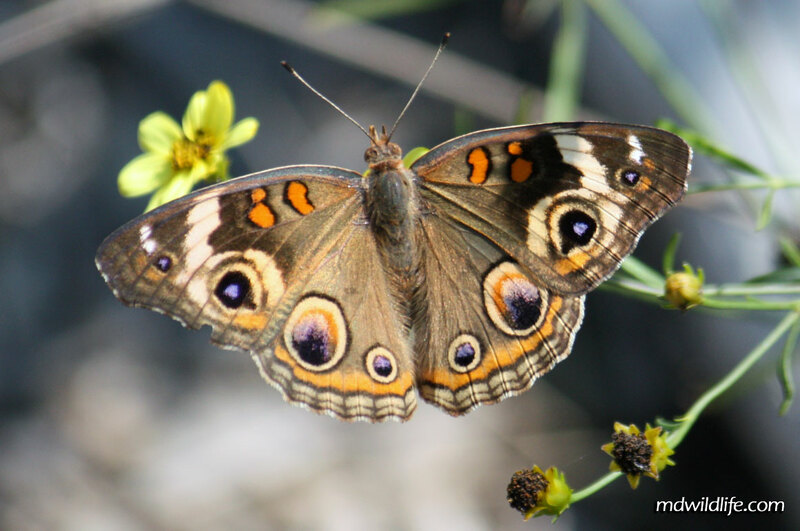 The Common Buckeye (Junonia coenia) is just that – common. Over the past two years, I have noticed it more in the summer months leading into the fall rather than earlier in the spring. I don’t see the Buckeye, typically until late July, but it seems that once I do, I can’t get away from it. It is unmistakable in Maryland as no other butterfly in the area has a smiilar appearance. The spread wing view is very obvious with large, round, purple eye patches. The Buckeye can show some different patterns from a closed wing position depending on the season and maturity. The Buckeye is a great subject to photograph because it often lands on bare ground where it can be easily spotted. It also will not move off to far when startled and usually provides multiple opportunities to the patient photographer.